The new and innovative Clear Collagen Peel-Off Masque by Alana Mitchell is the first step in putting your best face forward! 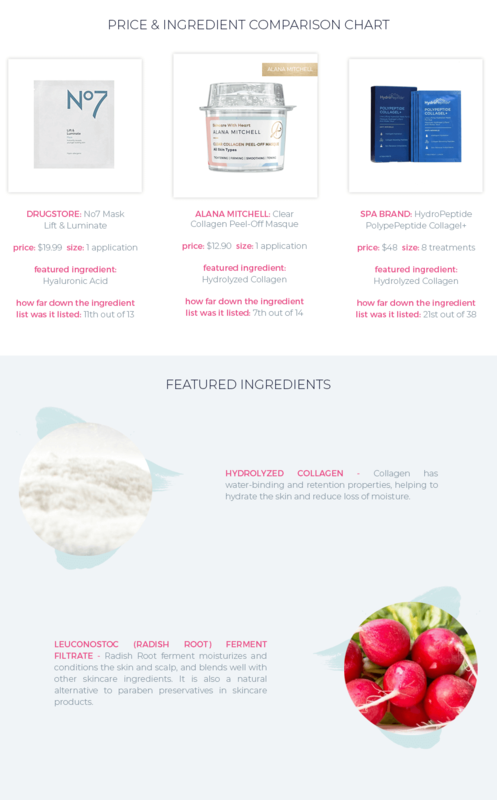 Using the power of hydrolyzed collagen, the natural formula reduces the appearance of wrinkles, removes impurities, and delivers instant firming and smoothing results by strengthening collagen synthesis. This one-and-done masque is the perfect skin perk-me-up for treating yourself, traveling, or a night out on the town. You can expect more youthful, revitalized skin after just 15 minutes! Need A Larger Version? Click Here To Buy The Multi-Use Masque! Step 1: Push top button to activate and release liquid into lower chamber. This will dissolve the collagen pillow, creating a masque. Step 3: Apply entire masque to face using upward strokes.